What is the jewelry finding called a "bail"? It's a jewelry-making finding that transforms a bead, donut, flat-backed component and other pieces into a necklace pendant or drop. Jewelry bails expand design options without metalsmithing or soldering. Bails for necklaces and other jewelry styles are created from a wide variety of materials (mostly metals such as sterling silver, brass, "pewter," precious gold and more), in a range of sizes and styles. A folding donut bail clamps over any small and medium-sized gemstone or glass donut and can be beaded directly into a necklace. These bails are jewelry enhancers, easily hung from chain or cord for a quick-change necklace: remove from chain, open bail, replace donut, close and re-hang. A pressure donut bail holds any small and medium-sized donut behind a detailed casting to create a pendant. A bond-on donut bail gives a donut the illusion of weightlessness. Bond donuts with two-part epoxy** or Loctite® 454. Wire bails turn any donut into an eye-catching pendant. This sterling silver wire piece works especially well for uncalibrated donuts, freeform donuts and go-go shapes. A fold-over bail is manufactured with two flat pads on each end of a straight portion, often with a leaf design. Metal folds in half. Two-part epoxy** or Loctite 454 is used to glue the pads to the item to be suspended. These bails work especially well for irregularly shaped flat items. A bell cap can make any object into a drop earring or pendant. Legs of the bell cap are bent to follow the shape of the object and are bonded in place with two-part epoxy** or Loctite 454. Add a jumpring. These bails work especially well for freeform three-dimensional items such as undrilled tumbled stones. A flat-backed "Y" bail has double loops to suspend it evenly along stringing wire, cord or chain. Has one pad for attaching an undrilled item (two-part epoxy** or Loctite 454 are recommended glues). An excellent choice to turn cabochons or other flat-backed components into quick pendants. Aanraku jewelry bails are copyrighted glue-on bails with a flat area for gluing on an undrilled item (two-part epoxy** or Loctite 454 are recommended glues). Flat area is textured for better adhesion. A flat pad glue-on jewelry bail has a large stringing hole and a flat area for attaching an undrilled item. Flat area is textured for better adhesion. Two-part epoxy** or Loctite 454 are recommended glues. This bail for necklaces and earrings is a two-sided finding which holds a drilled bead on a added pin or undrilled bead using a combination of pressure and adhesive. Two-part epoxy** or Loctite 454 are recommended glues. Findings which allow a bead, component or stringing material to be inserted or otherwise attached inside them. End caps can be used to create drops or to provide a professional attachment to stringing material using two-part epoxy** or Loctite 454. Add a jumpring. These bails work especially well for spherical items. These jewelry bails for pendants are specifically designed to transform the Yoko Ono inspired key focal components into pendants. Secure in place using two-part epoxy** or Loctite 454. Screw eye bails are bonded into the holes of half-drilled items with two-part epoxy** or Loctite 454. Add a jumpring to use as a pendant, dangle or drop. These glue-on bails for jewelry-making are bonded into the holes of half-drilled items with two-part epoxy** or Loctite 454. Add a jumpring to use as a pendant, dangle or drop. This style of glue-on jewelry bail has double loops to suspend it evenly along the stringing wire, cord or chain. Has a vertical peg for gluing into half-drilled beads (two-part epoxy** or Loctite 454 are recommended glues). This style of pendant bail has horizontal prongs which are pinched into the hole of a top-drilled bead. For extra security, use a bit of two-part epoxy** or Loctite 454 to secure the prongs in place. 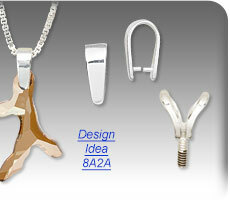 This style of pendant bail has a wide smooth bail and a split loop--just open, insert wire loop or jumpring and close. This style of pin bail is bulb-shaped with round bottoms, ideal for creating removable and interchangeable bails for adding charms, dangles, brooch attachments and more. These metal bails can be quickly snapped open to make a pendant attachment. Some styles use a magnetic clasp-style loop, some a hinge and a clip--others use simple tension to remain stable. These metal bails open and close with a snap or magnetic closure. The centerpiece is hung from the loop, hole or jumpring at the bottom of the bail for easy transfer from one necklace to another. Ideal for focal pieces that work with different parts of a parure (pah-RUR), or jewelry set, as well as being ideal charm bails. These metal bails have a wide smooth stringing hole and a split loop--just open, insert wire loop or jumpring and close. Make large-hole beads into pendants, quickly and easily. String bead onto shaft, add a jumpring to the hole on the top. Some styles have twist-off ends or require adhesives, others are just "string and go." When used as a bail finding, headpins turn beads into pendants or pendant drops. These bead bails easily connect beads without the use of a jumpring. Add beads, cut the pin to the desired length and make a loop. These jewelry bails temporarily change a brooch or pin into a pendant by allowing the pin to be slid through a tube, then latched closed. The brooch can be easily removed from the converter and worn again as a pin. Pin bails are available in both horizontal and vertical styles, with both styles having attached loops for easy hanging. Ideal for focal pieces that work with different parts of a parure (pah-RUR), or jewelry set. **When choosing between 5-minute and 30-minute two-part epoxy, refer to the length of time necessary to complete the entire gluing project. When working on a lengthy individual project or a multitude of smaller gluing projects, the 30-minute epoxy is recommended. When choosing adhesives for transparent and clear materials, opt for glues which will not cloud or discolor them. Remember to follow all safety recommendations for all types of adhesives.